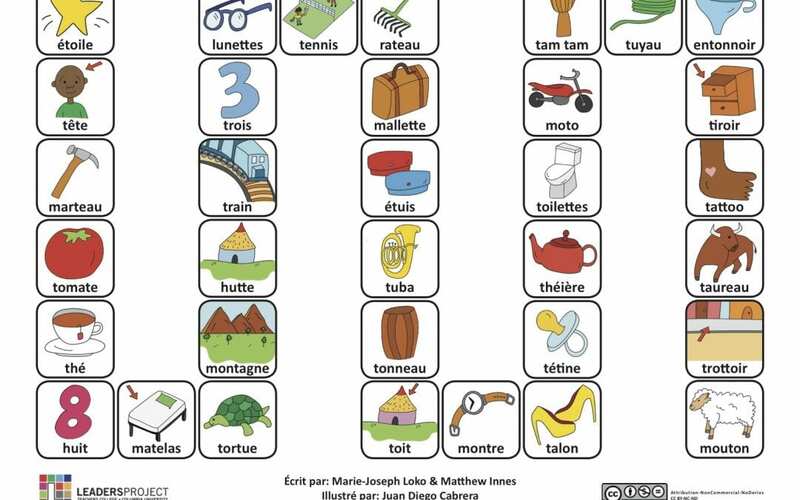 This is part of the series of French cleft palate speech therapy word games. This therapy game is unique in that it targets the one high pressure sound (T) the child is targeting paired with other low pressure and nasal sounds which the child should be able to produce free of error. This therapy game focuses on the /t/ sound. Children receiving speech therapy after a repaired cleft palate should practice speech sounds 100 times a day if they want to improve. With these therapy word games, children can practice at home with their family or on their own! The therapy game can be downloaded for free with this link. Begin the therapy game in the top left corner. Use a piece of paper or a coin as a game piece. Take a coin and make one side of the coin worth 1 space and the other side of the coin worth 2 spaces. Flip the coin and go the appropriate amount of spaces. Once you land on a space say that word 3 times. Have fun with this therapy game, as it is an exciting way to practice the sound with the family. Created by Marie-Joseph Loko & Matthew Innes, illustrated by Juan Diego Cabrera, and directed by Catherine Crowley.